What are those things you always want to achieve when selling your house? For most people, the most important things are being able to sell quicker at a better price. In a competitive market like the Boston real estate, you’ll need more than luck to get your property sold at maximum value. Want to learn how you can sell your home faster in Boston? These 21 tips will not only ensure you sell faster but they’ll also ensure you get top dollar on the transaction. You may have lived all along with stained ceilings, broken windows, missing tile, a heavily-scratched floor, or some other dents and issues. It’s fine though, after all, you’re the landlord of your house. But that is about that. Since you’ll be putting your home on the market soon, you won’t like anything to get in your way of making a great sale. If there is one thing that will greatly affect the way prospective buyers value your home, leaving these issues that need repairs unattended to is one thing that will devalue and de-market your property to a large extent. If you’re hoping to get maximum value before placing your home for sale in or near Boston, consider fixing any problem you can. It’s no doubt you’ll have one or more project you’ve left abandoned around the house. Whether this is a painting job you never get to finish or a ceiling fan you’ve bought but yet to be installed, go ahead and complete these projects before you welcome prospective buyers to check out what your property looks like. First impression lasts long and is true if you’ll be selling your house in Boston or anywhere else. You want buyers to be impressed at their first visit to the extent they’ll be imagining themselves living in there already. When your home looks appealing from the outside, buyers will have been impressed and deeply interested. When the interior also does not disappoint, it will give you an advantage as it would make your home more valuable and attractive. This, of course, is a recipe you’ll need if you’re hoping to get your home sold at the best price. We just can’t stress how important this is. Don’t make the mistake of thinking all those things that have made your living space seem tight and small would impress the buyer. To most people, this would usually be a turnoff. You’ll have to ensure you declutter each room in the house by about 50%. Remove excess materials on your shelves and in the rooms entirely. From tables to the shelves, to countertops, get rid of the things you don’t really need because there will be a lot of those. It is advised that you free the home by about half of all those things may have gone into making it cluttered and tight-looking. Another tip to make our home more valuable to prospective buyers is keeping it looking clean and fresh. Being dirty actually makes it less valuable to buyers. From the attic to the last point down, embark on a serious cleaning session cleaning ceiling lights, scrubbing walls, floors, and everywhere else that will need a clean new look. Get everywhere cleaned from the exterior to the interior. Even though prospective buyers may not consciously appreciate this, it will still go a long way to get them really interested in the property especially when every other thing is in order. As funny as it may seem, leaving out the little details can affect a buyer’s perception of your property. The real estate market in Boston is highly dynamic and competitive. The little difference any of these tips will make may end up being your winning point. Normally, you should have your furniture pulled away from the walls and arranged neatly. If it’s possible, you should remove some furniture to make the living area walkable and livable. You can’t afford to allow anything seem like a problem they’d encounter if they choose to move in. so when you plan to stage your home, ensure the furniture is orderly arranged. As simple as this may seem, it is a great marketing tool. The fresh new look of newly-constructed homes gives them a sort of advantage over resale homes but when you’re able to de-personalize your property for sale before welcoming buyers, you’ll be giving yourself this advantage too. Take down those photos on the wall and remove anything that may distract buyers’ attention when visiting the property. If you de-personalize your home, it will help the buyers see the home as a fresh and clean house which they can make their own. While we understand how sad and emotional you may feel when removing those personal items, you’ve got fewer options if you’ll be selling your home quickly and at a reasonable price in Boston and the surrounding areas. Whether it is a stain on the carpet or a pet smell that won’t go away, you’ll have to fix these issues if you want prospective buyers’ to value your home as you’d expect. Pets are great companions but they also have a few issues that come with keeping them. If there’s a stain they’ve caused, then clean. If there’s a foul odor, get rid of it. You may have to conduct a smell test since it is possible you may not even perceive the odor since you’ve been living with it all along. These occurrences, if left unattended to can affect buyers’ perception of the true worth and value of your property. To ensure you get the best offers, take care of this. Some may see this as overdo but it can be critical to landing great deals. In as much as you may have had your home painted in your favorite color, that same color may be the least favorite color of your prospective buyer. This will be less of a problem if the property is painted in neutral colors which to most people won’t be a problem. Getting the home painted in neutral tones may not make the color all that appealing to a buyer but it would also not make it unattractive. Rather, it will be easier for them to picture the walls with their favorite colors. Do you have doorknobs that are loose already? Leaving these and many others in the poor state they are would negatively influence buyer’s perception of your home. In a real estate market like Boston’s, you’ll have to be on top of your game to make everything work for your good. So, when you have any part of the home’s hardware that needs repair or replacement, don’t hesitate to attend to such before you list your home for sale in Weymouth, Cohasset, or any of the Boston neighborhoods. A fence adds real value to your property but not when it is in a poor state. So when your fence needs renovations and repairs, ensure this is fixed before you start getting offers for your home. It’s possible you may have wallpaper and murals on your walls. There is little doubt that they are beautiful and are attractive to certain individuals. Aside from the possibility of prospective buyers not finding your particular wallpaper attractive, it is not helpful if you are looking to de-personalize the house. Before staging your house, ensure those wallpapers are removed and cover up the wall with neutral tones of paint. When prospective buyers come to check out your house, they will open kitchen cupboards and check out closets. It sends the wrong message, when they open closet doors and are confronted with a dirty and unorganized mess. This is even more important for smaller spaces as storage is a major concern to prospective buyers. When you plan to sell your condo in Boston, do ensure your closets are properly organized in stacks and bins. When you have everything in proper order, it will be hard for the buyer not to see how your house is deserving of the price you’re asking for. It’s possible you still have those old lamps and lighting fixtures installed decades ago. If you’re planning to sell your house, it may be time to consider changing these to more modern fixtures. Buyers may have reservations when lighting fixtures seem to take them back in time. These upgrades will cost a few dollars but the impact on the transaction can be massive. No matter how hard you try to make the interior décor appealing, buyers will have their own picture of a perfect home in their mind. Most buyers understand that it is not possible to have all they desire and most times planning to make changes after their purchase. To make the process easier, it is better to adopt a simple-looking but beautiful décor. This will ease their imagination while they picture the possibilities of making their personal changes to the house. When décor is too extravagant and loud, it may interfere with a buyer’s imaginations thereby creating distractions. In most cases a home won’t attract an offer or will attract offers far below asking when prospective buyers can’t visualize how they’d fit in the home. Creating curb appeal makes the property look more attractive and part of good curb appeal is the enhancement of the landscape. When lawns are well-manicured and yards look their best, it certainly will back up the home as a reflection of both of its physical and intrinsic value. The world is becoming more and more digital with each passing day and we are gradually accepting the idea of a smart home. Even though older buyers may not find the idea very interesting, younger buyers would appreciate the addition of technology into a home. When the home has certain technologies such as a thermostat that can be controlled with smartphones, the value and worth of the home to prospective buyers significantly increases when compared the dinosaur technologies of the past. Today’s smart home technology equipment is getting more affordable so you may consider upgrading your house’s value with technologies that appeal to potential buyers. The bathroom can easily become a highlight and selling point of your house. If you’re planning to put your Boston home for sale in the near future, you may consider adding a touch of luxury to the bathroom. Potential buyers appreciate a bathroom with a soaking tub or one that feels like a spa. If you are able to carry out some cost-effective bathroom remodeling or renovations, it may add more value to your home making it easier to sell at a higher price. Adding plants and flowers to the environment can play an important role in the sale of your house. This will make the environment more appealing and welcoming. You can also replicate this indoors with flower vases. For some buyers, it may not really come across as a big deal but most prospective buyers will take it as a sign that your house has been well-kept and well-cared for. Buyers will usually hire a home inspector to assess the condition of the home during the sales process. It can be advisable for you to also get a home inspection before placing your home for sale. This will help to ascertain every part of your home that needs repairs so they don’t affect the sale down the line. The importance of a local realtor with a robust knowledge of the market should not be underestimated. If you are looking to get the best value for your house, you’ll need a competent and experienced Real Estate Agent to help you make data-backed decisions. With a local Boston real estate agent, it will become a lot easier to deal with offers. Negotiating will also be easier and at the end of the day, you’ll be able to smile when you’ve finally sold the house at a great price. 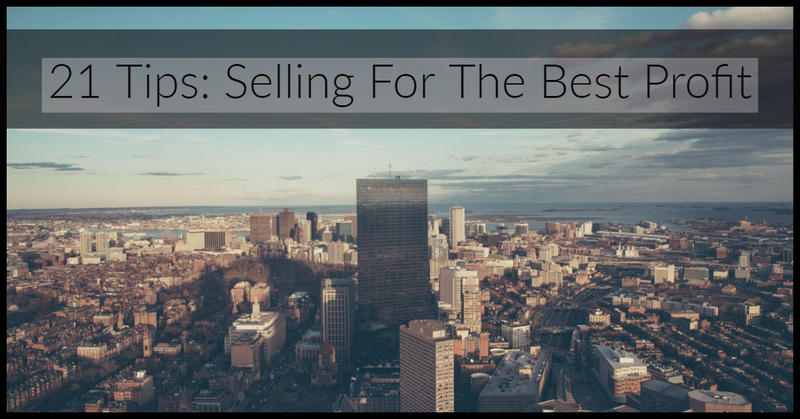 Although there are still some other things you may want to do to ensure you sell your house in Boston at a premium, these seem to be some of the most important tips if you want to sell faster and at a better price. The process will be easier and net you an offer with better terms and pricing with a one of the top Real Estate teams in the country.